Some conclusions, a house move and some upcoming stuff. Happy new year folks, it’s 2017 and the first couple of months bring with it some activities for interested parties to check out. First up; this coming Sunday the 22nd of January at 8:45pm I’ll be playing drums and percussion as part of No Mates Ensemble with Mat, Dani and Dylan for the live soundtrack to Man With A Movie Camera on the Main Stage at MONA. Really looking forward to it. The Unconscious Collective are presenting our next iteration of Hypnapod for M*Sync at the MPavilion at the Queen Victoria Gardens in Melbourne. This participatory installation will run from 9-14 February 10am-12pm & 2pm-4pm daily. In addition, on Saturday 11th of February, we are presenting a ritual/performance/cardiophonic symphony that will include multi-voice sampled sound clustering, a drone guitar soundscape and live voice performance from our special guest artist Gail Priest. Finally, just to add, the Unconscious Collective’s project for the Menzies Centre was completed in December. It will be launched soon, stay tuned for details. That’s it for now, hope you are all well. Be good. To tap into that dormant spirit. Catch a breath between the outrages. To try and fix many things may lead to burn out. Relative to me. Still, I mustn’t grumble. I’m coming through, we have reception. It’s been a while between posts. That is often a sign I’ve had a lot on. It’s seems rather daunting to try and catch you up to date with what’s been happening, so instead, maybe go check out my Facebook artist page and ‘Like’ it, if in fact you do. It is set to ‘Public’ so I believe that means even if you aren’t on Facebook you should be able to view it. I can quickly and easily do updates on there, though with a little less elegance than the newsletter or a blog post, but the info and often an image or two. So in the meantime a number of things have been keeping me busy and creative. I’ve been doing multiple things with the Unconscious Collective. The most urgent to mention perhaps is our work for the upcoming festival in Queenstown, Tasmania next week called The Unconformity. You can also find the schedule there and all the info you should need there as well. We are happy to officially announce that our studio will be based at the wonderful Paragon Theatre, which was the original home of local station 7QT many years ago. Also part of Unconformity, myself with Unconscious Collective have been co-producing with the good folks at Liquid Architecture something called Flux, a live sound environment in the old limestone Quarry. I’ve done some minor, co-curating and co-ordinating of some of the live performers in Flux, but also creating some sound design that contributes to the aural environment of the space. Along with performing a live installed sound work, Brendan Walls has also contributed to the sound design. With Unconscious Collective’s Michelle Boyde & David Patman physical design, Jason James’ lighting design, my sound design and the live performances and interventions overseen by Liquid Architecture, Flux should really be something. Another ongoing project with the Unconscious Collective has been Hypnapod. It’s seen a couple iterations so far, including one at the M-Pavillion in Melbourne, but we are currently working on a version called Colloquy Of Hearts for the Menzies Institute in Hobart. Stay tuned for more details as we get closer to finishing. I’ve recently submitted an entry into the Digital Portraiture Award. As of this writing I don’t know if I’ve been accepted, but thought I’d show a couple of stills from the video, self portrait called The Blind Constitution. That’s it for now. Take care all, see you around. Some kind of brave new world, to take care of the vessel. Standing on the edge of the lookout, resisting the urge. Is it some kind of vertigo? I say this all the time, but I do plan on making posts a little more regularly. So for my first post for 2016, I’ll start with this. As I mentioned last post, the plan is to put to rest the solo projects under other names and concentrate on my own. It’s not that I dislike anything I’ve done under those names, but I don’t like clutter. So as a farewell, both to 2015 and to mumble(speak); here is a final track. So January is going to be a pretty busy month and here’s what’s happening. My friend and sometime collaborator Amanda Shone is creating a work called Viewpoint appearing at MONA FOMA in conjunction with Salamanca Art Centre’s Situate: Art In Festivals. I created some sound design in collaboration with her for the piece. I really like what I created and can’t wait to experience it in situ. I will be presenting a workshop on called: Finding new experiences through sound: the difference between hearing and listening on the 19th. Thanks to Situate and SAC for asking me. Haunts – the irregular live video and sound collaboration project with Scot Cotterell and Andrew Harper will be performing in support of Omahara at new Hobart Artist Run Initiative Visual Bulk on January 30. Here’s what happened last time we did something. Machines Of Indeterminate Origin continue to arrange and record for our next release. Also to ring in the new year M010 did an imaginary ‘Rage’ programming playlist on Mixcloud. M010 haven’t gigged much in 2015. We released our single with an intimate show back in April and have been writing, arranging and recording on and off since then. We thought we’d end the year with a playlist of what we like, what we listen to regularly and things that have influenced us. The Danzig cover appeared as a ‘hidden’ track (# 66) on the now virtually out of print CD version of our second EP ‘0.5 – ASSUMPT10N’ from 2011. Wish me luck, be good to each other. When you decide your priorities, you can set yourself free. I’m an artist, this is what I do, this is what I contribute to the world. But it’s not all that I do, I’m a partner, I’m a father and in my own very small way, I’m an activist. The balance between all these facets can be balanced, but it’s a struggle sometime. So much time can be spent worry about what others will think, what can go wrong, rather than what can go right. It may in fact stop you doing anything at all and then worrying about not getting anything done…well you get the picture. I do not take my ‘lot in life’ for granted, nor do I wish this to come across as complaining. When you decide what you do is important to you, you need to figure out how it best can be done and this may well be a life-long, ongoing process. Making adjustments along the way. Shout your mantra from the rooftops. It’s been a long time between teetotaling drinks, it was May 30 since last time I posted about my activities. Here’s an update of what I’ve done and what’s to come. Julian Day, Mick Harris/Lull, Jason James, Christina Kubisch and Elizabeth Veldon. It was an honour to curate them into this show that was presented at the ever-wonderful Contemporary Art Tasmania Gallery and was included in the program of Dark Mofo festival. Here are a collection of relevant links to info, reviews and related podcasts. “Envelop(e)” – exhibition slideshow with in situ sound. from Matt Warren on Vimeo. The Unconscious Collective: As some of you would know, since ‘Motel Dreaming’ at last year’s Dark Mofo festival, I’ve worked as part of The Unconscious Collective and have a number of current projects underway (and some future ones) in collaboration with them. The Unconscious Collective were invited to curate a winter road trip, art event and wilderness sleepover experience, presented by Cradle Mountain Hotel and Dark Mofo in June 2015. As well as some smaller video elements, I did some extensive sound design throughout the project. This is an 8 minute walk-through in approximate chronology of the sound design I composed and created for the event called Wild At Heart. Also with The Unconscious Collective: I’ve been working on an R&D project called Hypnapod. “HYPNAPOD is a live audio-visual artwork generated by the collective biorhythms of sleeping audience members. It’s had a couple of experimental iterations so far. We are looking at further experiments in the future with a major iteration in the new year to be announced. Forest Of Dreams. On 4 January 2013, a bushfire swept through the coastal town of Dunalley, destroying many houses and public buildings, including the local primary school. In 2014, David Patman, Michelle Boyde, Matt Warren and Gerhard Mausz were commissioned to undertake a public artwork to be installed in the new Dunalley Primary School. As far as my own personal art practice goes, the next major thing is a planned artist residency in Santiago and Valdivia, Chile. It is part of an overall project called ‘Black Matter’ as curated and overseen by Francisca Moenne and I am one of three Tasmanian artists due to travel. I’m looking at going over in early March and returning early May. I have a number of aesthetic experiments I intend to undertake and I hope to explore notions of place, memory, sonic histories and hauntology. It will be supported in-kind by MAC (Museo de Arte Contemporaneo) and Galeria Metropolitana and financially by Arts Tasmania and (hopefully) Tas Regional Arts. Some video work, sketches, in progress and tying up some loose ends. This leads me to the following as it’s an interesting time. After a number of comments bringing to focus the number of solo projects I have (or have had in the past) under a number of names other than my own, I’ve been wondering something. Although the comments have not been in any way negative, they have bought up some personal questions. After some consideration, I’m thinking about laying to rest the monikers such as mumble(speak), The Non-Compliant Airmen, Broken Tiny…time to grow up? Be myself? I’ve had some conceptual and aesthetic reasons to give these solo recordings and performances their own names rather than my own, but why not just accept they are all part of my own creative makeup? You’ll likely see future releases that may previously have been aesthetically related to another name, simply be under my own. Nothing definitive, I suppose, maybe I’m just thinking out loud. 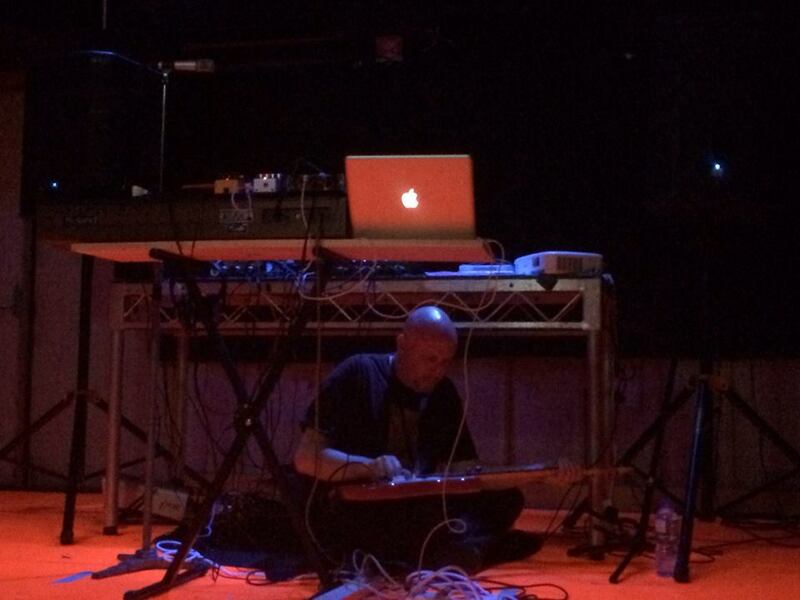 Following on from our collaborative performance at Sound Klub 13, Pip Stafford and I performed together again, this time at Nancy Mauro-Flude’s event: ‘Core Litany: gnostic computing transformation furnaces, calcite field divination & crystallography.’ – Plimsoll Gallery, Hobart on Aug 28, 2015. We are talking about doing some kind of release of a studio recording. Stay tuned. Thanks for your attention, be good to each other. Primarily I use this blog as a bit of a promo/info/art project device. But very occasionally I’ll post some thoughts because although my work is not overtly political or a societal statement, my mood and state of mind whilst making this work is invariably informed by what’s going on around me. If you are just interested in my art and music practice, feel free to skip this post, no problem. If you are interested in just one man’s opinions, read on. Often I hear the phrase “Political Correctness gone mad/out of control”. It kind of bugs me. Not always of course, but it seems to me a lot of folks use it when they are trying to defend their own bigoted views that someone has called them on. The beauty of freedom of speech is that it can only work if it goes both ways. If you say something offensive to someone, they have the right to call you on it. I do really feel that as far as ‘Political Correctness’ goes, we are all still learning how to use it, it’s a work in progress. Of course, some will likely take it too far, look to be offended and forget that their own sense of humour is not the same as someone else’s. However, I have noticed some general improvements to the way we interact with each other as a result of Political Correctness. We are not always going to get it right, but like a tighter gun control in the US (another rant for another time), why not give it a go? I recently came across this excellent little bit by UK comedian Stewart Lee that sums it up. The need to be right/correct. As in above, being that we are still a work in progress, I think it’s totally fair for people to make mistakes, be allowed to learn, be corrected and have their minds changed without being shamed, bullied or overtly embarrassed into it. Not everyone is on top of every gender, social, religious or political iteration. We are a complex bunch and although I really urge people to see as many shades of grey as you can, you are not always able to ‘get’ something straight away…maybe never. Ignorance is not bliss and if you say something uninformed or in a knee-jerk way please expect to be questioned, possibly factually corrected and called on. But I find it unfortunate that in a time when information is easy to access, misinformation or disinformation is just as easy to find. Be patient with people…I think most of us want to be the best we can be and most of us want to just get along with our fellow humans. Take some time to explain, not to attack or ridicule when someone gets something wrong. We can’t all be right all the time. If you think you are righteous, I suspect you aren’t looking at yourself hard enough. With the advent of recent terrorist attacks around the world, inevitably emotions are heightened. Due to certain posts on social media, I am privy to attitudes from certain folks that surprise me. I guess the onus is on me to never assume the progressiveness (or conservative-ness for that matter) of any individual, especially based on their non-meat facade. Some of the war-mongering and xenophobia that has emerged in the wake of these attacks has alarmed me. So with this in mind, here is this; Terror is a state of mind, induced by terrorists with a specific ideology, which in itself is a belief, another state of mind. As far as I can figure out, you can’t eradicate a state of mind by dropping bombs on it or shooting it. Yes terrorists can be destroyed as they PHYSICALLY exist, terror and ideology do not. One needs to consider a way to change these minds. And I have no idea what the answer or solution to that is, but I don’t think killing folks for killing folks will fix it. It may in fact make it worse. As far as I can tell, there is no such thing as a ‘war on terror’. It seems like nonsense, like something George Bush Jr would have come up with. And while I’m at it, I’m not sure guilting people and judging them for where their apparent sympathies and empathy lay is at all useful. Sometimes ignorance is not malicious or willful, it’s just ignorance. Draw people to others plights with respect and simplicity, not from an ivory tower of superiority. Exhausted by some of the decisions I’ve made, inspired by seeing a long admired artist’s body of work. Growing older, breathing, opening eyes, disappointed by elements of humanity, overjoyed by others. It’s been a while, bit of a catch of whats happened over the last few months. 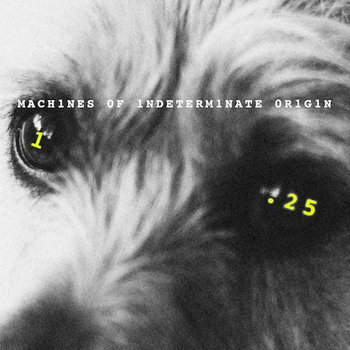 My duo with Aaron Metcalf known as Machines Of Indeterminate Origin recently released a single called ‘Meat Dog’/’Calculator’. With an impending new body of work on the horizon, M010 thought it would be nice to release this transitional material as a 2 track single, both sides reflecting M010’s varied sound and influences. 2. A limited edition of 20 lathe cut 7″ singles – individually hand cut by Peter King in NZ, housed in acetate hand numbered sleeves and including download code for digital versions of both stereo and mono mixes. 3. A limited edition of 15 CD/DVD packs containing a CD single and a DVD of 5 M010 video clips. M010 will now continue to woodshed and work on the new material. Stay tuned. I had the pleasure of playing drums alongside Brendan Walls and Greg Kingston at Kelly’s Garden, Salamanca Arts Centre, for a kind of live performance iteration of Brendan’s installation called Elements Of Refusal on Saturday Feb 7. No sure if anyone got a recording…it was great fun. Would love to do it again. Here’s the kit in situ! Played with Mat Ward’s No Mates Ensemble at Rosny Farm for the opening of Kerosene Child/So I Ran My Camera on Feb 18. Here’s the result. Will be working with Mat again in the future, stay tuned! On March 2, 2015 I presented my final show of The Small Hours radio show. Not indefinitely, but am on hiatus for a while. I love doing the show, there’s no other reason to stop other than I currently don’t have time. I will try and update the Mixcloud page and archive my show. In Silence Stands (Mondo Box – Burnie 2014) started in June 2014 whilst on residency in Burnie and completed in March 2015. 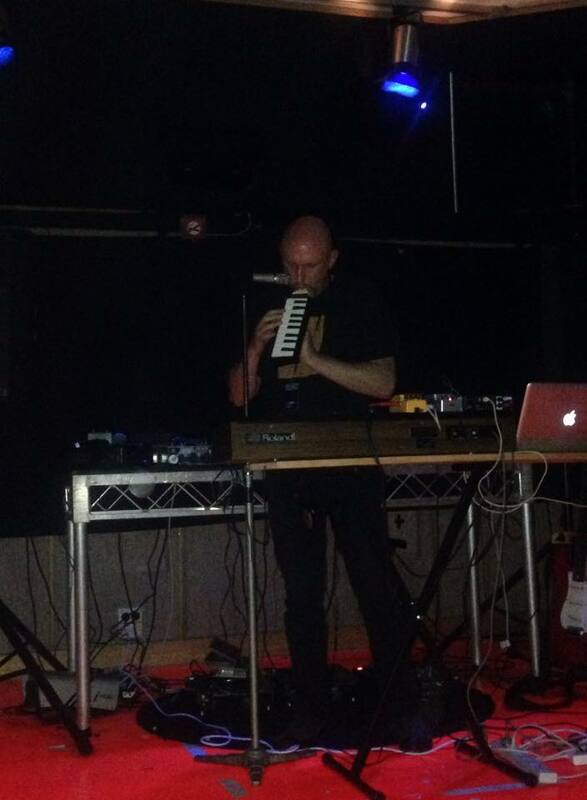 I performed for the first time with the very excellent Pip Stafford at Sound Klub 13, Grand Poobah, Hobart. Thursday April 23, 2015. Recorded by Menno Bontes. Julian Day (AUS), Mick Harris (UK), Jason James (AUS), Christina Kubisch (GER) and Elizabeth Veldon (UK). That’s it for now. See you on the other side. Some of us, in our own ways, are trying to break the negative cycle. You would think it would be common sense to not cross certain lines or enter certain circles before being invited wouldn’t you? Think! Living in the dark, you sometimes need to make your own light. And vice versa. Shouting online is still just 0s and 1s. Today, I walk this ground with respect, for those who walked before me, those who will walk in the future. The Earth was here before us all. And the sounds return and can be heard outside the dome. An incessant hauntological wormhole equals a fairly sleepless night. January saw a flurry of activities. I was in a show of 3 exhibiting artists (along with Sally Ann McIntyre and Alex Bishop-Thorpe) in the Paddy Lyn space at my old Gallery Coordinator stomping ground (albeit with a different name) Constance ARI. Opening on January 9 and presented as part of MONA FOMA, I presented a surround-sound, object and light installation called Time Is Of The Essence (ritual space). It looks and sounds a little like this. If you are in Hobart, it runs until January 31. Constance ARI – 100 Goulburn St, Hobart. My duo Machines Of Indeterminate Origin played our first gig of 2015, on January 10 at the Grand Poobah with Eden and Dead Horse. It was an interesting gig in many ways and prompted the band to change up some things about our approach to playing live, possibly not visible to punters, but will be for us. Here is At The Party from the show, I’m sure folks may recognise the topical reference! I haven’t performed a DJ Broken Tiny set for a while, but thanks to Jordan Marson’s excellent event ‘The Noise Edition‘ I had the opportunity to do so. This event was a kind of alternative to MOFO, a one day show of experimental music over two stages at the Grand Poobah. I saw a few sets during the day, oscillating between there and PW1 (home of MOFO live gigs). Following the Swans set, I wandered back up and played a set of krautrock, space rock and garage psych. Folks seemed to dig it and I really enjoy doing it. Let me know if anyone wants some spinning of discs in that or a related vein. First mumble(speak) show for about 6 months. As mentioned above my show at Constance, runs until the 31st and will culminate in an artist talk, which will actually be a conversation between myself and fellow exhibitor Sally Ann McIntyre. We will basically be interviewing each other and sharing the questions as well as opening it up to the audience. Saturday Jan 31 at 2pm; Constance ARI – 100 Goulburn St, Hobart. at the Brisbane Hotel, Hobart on Saturday February 7. 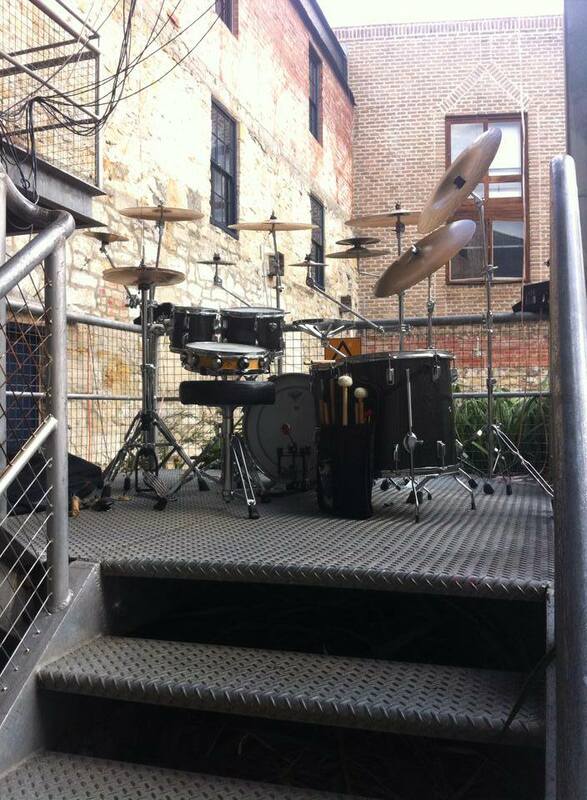 Also earlier that day, I’ve been invited to perform drums in a performance with and guitarist Greg Kingston and Brendan Walls with his installation at Kelly’s Garden, Salamanca Arts Centre, called Elements Of Refusal as part of a series of Saturday on-site performances. Saturday Feb 7 5:30pm. Be good to one and other.